In 1907–08 Brian had composed a burlesque programmatic work which he called A Fantastic Symphony. Almost immediately he destroyed half of it, keeping just two movements as independent works, yet in light of this The Gothic was first published as ‘Symphony No 2’, and it was only in 1966 that Brian re-numbered his early symphonies so that it became ‘Symphony No 1’. In his enormous symphony, Brian had indeed striven ‘with all his might’ to create a monumental work of symphonic architecture at a time when he was beset by personal and financial difficulties and his professional career was in the doldrums. It is also a tribute to all the music that Brian had known and loved, and all the people he cared about. ‘This work’, he wrote to his friend Granville Bantock on 27 June 1926, ‘has been inside my heart for a lifetime and naturally there is inside it all those who have been very dear to me—who helped and moulded me.’ On another occasion he spoke of the fifth movement (the ‘Iudex’) as his personal memorial to Hans Richter, whose conducting of the Hallé Orchestra had been such an inspiration to Brian in his youth. So The Gothic is an acknowledgement of debts to the past, and a manifesto for the future: a massive reaffirmation of the idealism of the ‘English Musical Renaissance’ which had been so cruelly shaken by the 1914–18 war. We may speculate, too, that its moments of violence and terror relate directly to the experience of that war. Brian once told his friend the composer and writer Harold Truscott that the work came to him in a flash so intense that he wanted to cram the whole of it into about twenty bars. The remark tells you something important about Brian. He was not an extravagant or self-indulgent composer. On the contrary, he was a very concise one. In The Gothic he was composing-out an intense moment of vision as briefly as he knew how. One aspect of this—and it is a characteristic that persisted through all his later works—is that he hates elaborate transitions: he doesn’t smooth the way between one idea and the next, and he composes essences, not passages of filling. The orchestra contains many unusual extras: oboe d’amore, bass oboe, corno di bassetto, pedal clarinet, cornets, bass trumpet and euphoniums among them. Brian attributed this to a suggestion Henry Wood made to him in 1907, that he should write a work to include the complete families of all the different wind instruments—all the oboe family, all the clarinets and so on. Brian uses these, though, not to get a huge undifferentiated noise, but to gain an unprecedented range of subtle instrumental colour. ‘Completist’ in its approach to instrumental timbre, The Gothic is also an encyclopedic compendium of musical styles, from evocations of Gregorian chant and Elizabethan church music to near-atonality and (in the ‘Iudex’) vibrant cluster-chords. Brian poured into it everything he knew; and one of the things he knew from his earliest years was that crack virtuoso competitive choirs could perform the most complicated test-pieces with pinpoint accuracy. The orchestral players are set some severe challenges in The Gothic (the xylophone solo in movement 3 is something like a transcendental étude for the instrument, for instance), but these are child’s play compared to some of the choral writing, especially the intense chromatic polyphony which is one of the Te Deum’s hallmarks. Brian was fortunate in finding a publisher for his symphony in the London office of the German publisher Cranz, who in 1932 issued the full score in two gigantic (and error-riddled) volumes. Though the published score bears a dedication to one of Brian’s lifelong heroes, namely Richard Strauss—who after a perusal of the score pronounced it ‘magnificent’ (‘großartig’) and expressed his hopes for a speedy premiere—very little of the work (some passages in movements 1 and 3, perhaps) shows much of Strauss’s influence. Berlioz—particularly the Berlioz of the Grande messe des morts—is a more relevant progenitor. The Gothic is in fact the most extreme example of the perilous hybrid genre that Beethoven initiated with his Ninth Symphony. 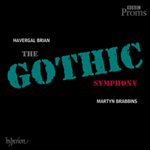 In what sense is Brian’s work a ‘Gothic’ symphony? He doesn’t use the word with its comparatively modern meaning of ‘horrific’, though some dark and terrifying things do happen in the work’s course. He means the high and late medieval period (approximately 1150–1550), the Gothic era as we understand it through its defining creation, the Gothic style of architecture, whose ultimate expressions are the great Gothic cathedrals of Northern Europe. This was the age that excited the imaginations of the great Romantic artists, to whose achievements Brian was heir. And into that age, into the stones of its cathedrals, was etched the ultimate certainty that life is a struggle between good and evil. Composed through a period of seven or eight years (mainly at night, while Brian worked as a music-copyist and journalist and at various odd jobs through the day), The Gothic unites two long-contemplated schemes—a work on Goethe’s Faust and a setting of the Te Deum—in a symphonic vision of the Gothic Age as a period of almost exponential expansion of human knowledge, both secular and spiritual, glorious and terrible. The first three movements, for large orchestra, relate in a general way to Goethe’s Faust, Part 1 (Faust as the archetypal Gothic-Age man, aspiring mystic and seeker after hidden knowledge). But they are merely a prelude. The fourth, fifth and sixth movements encompass a gigantic, hour-long setting of the Te Deum, and here Brian requires four vocal soloists, two large double choruses totalling about 500 voices along with children’s choir, four brass bands, and an orchestra that out-bulks the most extreme demands of Mahler, Strauss or Schoenberg. Taken literally, the score requires at least 32 woodwind, 24 brass, two timpanists, a percussion section involving 17 players, two harps, celesta, organ, and an enlarged string section of at least 20 first violins, 20 second violins, 16 violas, 14 cellos and 12 double basses. This is for the main orchestra. The brass bands each comprise an additional two horns, two trumpets, two trombones, two tubas and a set of timpani. At minimum, therefore, Brian envisaged about 750 performers. The 2011 Proms performance was the first to reach and surpass that number in near-ideal conditions: altogether over 800 singers and players were involved. Three different levels of musical argument—dramatic, tonal, motivic—create the work’s musical logic. On the expressive plane, Part 1 is dynamic in the familiar symphonic sense, a logical development from the achievements of Wagner, Bruckner, Strauss, Elgar and early Schoenberg. Part 2, however, becomes cultural drama, evoking the totality of Western Music around one great familiar unifying text. The overall tonal progression is a strikingly rich and dramatic example of what is sometimes called ‘progressive tonality’, moving from an initial D minor (the principal key of Part 1, which ends in D major) to a new centre of E major. Intermittently foreshadowed in Part 1 and established during movement 4, it is then frequently threatened by other keys but survives into the darkly glowing choral murmur of the work’s final bars. The keys are, however, often interpreted very freely, expanded by chromaticism or modal inflection. The first movement opens with a thrilling orchestral gesture that propels us into a modified sonata-allegro with a terse, wiry first subject in D minor. Its initial shape—a leap of a third and then, from the same base note, to a fifth—is a germinal motif, encapsulating the drive to expand outwards, that will grow and change throughout the entire work. A lyrical ‘folk-like’ second subject, announced by a solo violin in D flat and later turning to D major, makes an extreme contrast. A tough development section seizes fragments of both themes and the orchestration takes on a fantastic quality. The recapitulation starts with a beautiful violin cadenza that recalls the second subject, now in E major. The first grandiose entry of the organ is a surprise Brian reserves for the final bars. The second movement is a haunted processional in 5/4 time. Two elements—a dotted-note rhythm heard on tubas and timpani and a noble, flexible march-melody stated by violas and cellos immediately afterwards—are developed in association and in competition. The music rises to climactic statements of the march-theme: the grandest of these climaxes subsides suddenly into the shadows, and a bass clarinet leads directly into the Vivace scherzo-finale of Part 1. Here a rushing Bruckner-like ostinato in D minor kicks off a series of contrasted episodes at different speeds, establishing a huge, relentless, underlying momentum. The work’s principal motif recurs as a mysterious, glowing horn-call, and becomes a bass for violent, warlike developments, full of march-and-fanfare images. These culminate in a fantastic transformation of the ostinato, weirdly scored, with a bizarre xylophone cadenza that is eventually sucked into a skirling polytonal heterophony. Four descending trombone pedal-notes, amplified by all the low brass instruments, plunge into a thundering climax that is the logical culmination of the earlier battlefield imagery. A crushingly decisive cadence hurls the music back into D minor; it is suddenly cut off for a coda of unexpected calm, ending on a last shimmering triad of D major that also opens Part 2, the huge three-movement Te Deum. In the Te Deum Brian’s inspiration was the great Gothic cathedrals of Northern Europe, whose architecture (and the music that was sung in them) had transfixed his imagination since he first saw Lichfield Cathedral as a child chorister. But Brian was not a believer in any doctrinal sense. His is not a religious but a secular Te Deum, an interpretation of the text as a human and communal drama; no conventional expression of praise but an evocation of the human spirit struggling against immense odds, where the will to rejoice is threatened at every turn. It is this that makes the quotation from Faust on the symphony’s title-page so apposite. This Te Deum attempts a new, freely evolving conception of structure while making use of the widest possible range of stylistic resources. It spans a great arch from neo-medieval vocal polyphony to shattering brass outbursts of purely twentieth-century barbarity. Writing in 1962 in The Penguin Book of Choral Music, having heard only the work’s first, semi-amateur performance, the late Deryck Cooke described Brian’s setting as ‘a dithyrambic paean of complex neo-medieval counterpoint like nothing else in music’, that ‘reveals the mind of a truly visionary genius’. Here Brian employs his full forces in the most disparate kinds of music, and the text itself becomes a unifying force, relating the various musics to the central stream of thought. So the symphony’s fourth movement is concerned with praise and statements of the acts and nature of God. The radiant opening introduces first the choruses, then the vocal soloists. After a big orchestral fanfare the full forces are unleashed in a fantastic musical act of multitudinous rejoicing. From here the music evolves through a series of contrasting episodes which impose a formal logic on the treatment of the text while the mood darkens. Movement 5 sets just one terrifying line of text: ‘Iudex crederis esse venturus’ (‘You are believed to be about to come as judge’). It opens boldly with the four choruses singing in overlapping triads, creating dense, glowing chord-clusters. The solo soprano sings the complete text, and the choirs launch into polyphony of fantastic complexity and fierce dissonance, divided in over twenty parts. After a wordless vocalise for solo soprano and a thrilling fanfare for eight trumpets, the orchestra enters for the first time with a grim juggernaut of a march. The four choruses, supported by separate brass bands, each proclaim the text with intervening orchestral refrains. A vigorous orchestral development follows, gradually becoming more intense. Eventually a thunderous outpouring of sound from the full forces (brass bands included) resplendently confirms the final E major. The sixth movement is the longest of all, containing the greatest contrasts of material, expression and scoring. A solo oboe d’amore introduces a floridly expressive tenor solo (‘Te ergo, quaesumus …’). A kind of celestial dance begins in the orchestra, brilliantly and brightly scored, with wordless participation from the choirs. Gradually Brian builds up the most texturally complex passage in the whole symphony, with a huge climax for the full forces. ‘Salvum fac populum tuum’ brings a return to antiphonal chanting of the kind heard in the fourth movement. After further episodes, nine clarinets in a row present a jaunty marching song that introduces a joyously tuneful setting of ‘et laudamus nomen tuum’ which builds to a roof-raising climax of forthright splendour. The mood darkens for an anguished, imploring bass aria (‘Dignare, Domine, die isto’) followed by a rapt double-fugue for choirs alone, whose subject harks right back to the opening of the symphony. This cadences sadly into E minor, and then all hell is let loose. The full brass of the orchestra and the bands, with six timpanists and percussion, unleash two diabolically dissonant assaults upon the ear and provoke two agonized choral cries of ‘non confundar in aeternum’. The coda, with its impassioned cello line, is as desolate a voice from the depths as any in music. But the final choral murmur is in E major, serene and unaffected: a mysterious radiance that, as Thomas Mann has it in Doktor Faustus, ‘abides as a light in the night’. Owing to its extraordinary array of forces, The Gothic requires an especially spacious venue. The premiere took place thirty-four years after its completion, at Central Hall, Westminster, on 24 June 1961, with semi-professional forces conducted by Bryan Fairfax. The first fully professional performance, mounted by the BBC, came five years later, when Sir Adrian Boult conducted the augmented BBC Symphony Orchestra on 30 October 1966 in the presence of the ninety-year-old composer at the Royal Albert Hall, the only venue which has heard the music more than once. On 25 May 1980, The Gothic returned to the Royal Albert Hall for a second BBC-sponsored presentation, with Ole Schmidt conducting the London Symphony Orchestra, and its third presentation there was its first performance at the BBC Proms, in 2011. En 1907–08, Brian avait composé A Fantastic Symphony, une œuvre programmatique burlesque dont il avait détruit presque immédiatement la moitié, n’en conservant que deux mouvements sous forme d’œuvres indépendantes; The Gothic parut donc, d’abord, comme sa «Symphony no 2» et ce fut seulement en 1966 que, renumérotant ses premières symphonies, il en fit sa «Symphony no 1». C’est que, dans son énorme symphonie, Brian avait effectivement cherché de toutes ses forces à créer une monumentale architecture symphonique, à un moment où il était assailli de difficultés personnelles et financières et où sa carrière était en plein marasme. Elle est également un tribut à toute la musique qu’il avait connue et aimée, à tous ceux auxquels il tenait. «Cette œuvre», écrivit-il à son ami Granville Bantock le 27 juin 1926, «a été en mon cœur toute ma vie et elle renferme naturellement tous ceux qui m’ont été très chers—qui m’ont aidé et façonné». Une autre fois, il qualifia le cinquième mouvement (le «Iudex») de mémorial personnel à Hans Richter, dont la direction du Hallé Orchestra l’avait tant inspiré, dans sa jeunesse. The Gothic est donc ensemble une reconnaissance de dettes envers le passé et un manifeste pour l’avenir: une massive réaffirmation de l’idéalisme de la «Renaissance musicale anglaise», qu’avait si cruellement ébranlé la guerre de 1914–18—une expérience à laquelle ses moments de violence et de terreur sont, on peut le supposer, directement liés. Brian confia à son ami le compositeur et écrivain Harold Truscott que cette œuvre lui était venue dans un flash si intense qu’il voulait fourrer le tout dans une vingtaine de mesures. Voilà qui nous dit une chose importante sur lui. Il n’avait rien d’un compositeur extravagant ou complaisant. Bien au contraire, il était très concis. Dans The Gothic, il composa une vision intense, fugitive avec toute la brièveté dont il était capable. Cette écriture se caractérise—et se caractérisera dans toutes ses œuvres ultérieures—par une détestation des transitions élaborées: il ne lisse pas le passage d’une idée à une autre; il compose des essences, pas du remplissage. L’orchestre se voit adjoindre quantité d’instruments insolites: hautbois d’amour, hautbois basse, cor de basset, clarinette contrebasse, cornets, trompette basse et euphonium, entre autres. Ces ajouts, Brian les attribua à une suggestion que Henry Wood lui avait faite en 1907: écrire une œuvre où figureraient toutes les familles des différentes instruments à vent (toute la famille des hautbois, toutes les clarinettes, etc.). Toutefois, Brian ne s’en sert pas pour obtenir un très gros bruit indifférencié, mais pour gagner une palette d’une couleur instrumentale subtile, sans précédent. Exhaustive dans son approche du timbre instrumental, The Gothic est également un précis encyclopédique des styles musicaux allant des évocations du chant grégorien et de la musique d’église élisabéthaine à l’atonalité et (dans le «Iudex») aux vibrants accords en clusters. Brian y versa tout son savoir; et, depuis sa prime jeunesse, il connaissait notamment les meilleurs chœurs de concours virtuoses, capables d’exécuter avec une parfaite précision les plus complexes morceaux imposés. The Gothic donne du fil à retordre aux instrumentistes orchestraux (le solo de xylophone, dans le mouvement 3, tient ainsi de l’étude d’exécution transcendante), mais c’est un jeu d’enfant comparé à ce que l’écriture chorale réserve parfois—surtout l’intense polyphonie chromatique qui est un des sceaux du Te Deum. Brian eut la chance de trouver un éditeur pour sa symphonie: en 1932, l’antenne londonienne de l’Allemand Cranz publia la grande partition en deux gigantesques volumes (bourrés d’erreurs). La partition publiée a beau être dédiée à Richard Strauss—ce héros que Brian admira toute sa vie et qui, après avoir examiné la partition, la déclara «magnifique» («großartig») et exprima l’espoir d’une première rapide—, l’œuvre laisse fort peu transparaître (certains passages des mouvements 1 et 3, peut-être) l’influence straussienne. Berlioz—surtout celui de la Grande messe des morts—est un précurseur davantage pertinent. Au vrai, The Gothic est l’exemple le plus extrême du périlleux genre hybride initié par Beethoven et sa Symphonie no 9. En quel sens l’œuvre de Brian est-elle une symphonie «gothique»? Le compositeur n’emploie pas ce terme dans son sens relativement moderne d’«horrible», encore que certaines choses sombres et terrifiantes soient bel et bien présentes. Non, il entend par là le haut Moyen-Âge et la fin du Moyen-Âge (env. 1150–1550), le gothique tel que nous le comprenons à travers sa création-définition, le style architectural, dont les expressions ultimes sont les grandes cathédrales gothiques d’Europe du Nord. Ce fut l’âge qui excita l’imagination des grands artistes romantiques, dont Brian fut l’héritier. Et dans cet âge, dans les pierres de ses cathédrales, fut gravée l’ultime certitude: la vie est une lutte entre le bien et le mal. Composée sur une période de sept ou huit ans (surtout la nuit car le jour, Brian était, entre autres, copiste musical et journaliste), The Gothic unit deux projets de longue date—une œuvre sur le Faust de Goethe et un Te Deum—en une vision symphonique de l’ère gothique en tant que période de développement presque illimité du savoir humain profane et spirituel, glorieux et terrible. Les trois premiers mouvements, pour grand orchestre, se rattachent globalement à la Partie 1 du Faust de Goethe (Faust, archétype du gothique, ambitieux mystique en quête du savoir caché). Mais ils ne sont qu’un prélude. Les quatrième, cinquième et sixième mouvements englobent un gigantesque Te Deum d’une heure, et Brian requiert alors quatre solistes vocaux, deux grands doubles chœurs, soit environ cinq cents voix et un chœur d’enfants, quatre fanfares et un orchestre qui surpasse en masse les plus extrêmes exigences de Mahler, Strauss ou Schoenberg. Si on la prend au pied de la lettre, la partition exige au moins trente-deux instruments à vent en bois, vingt-quatre cuivres, deux timbaliers, une section de percussion faisant intervenir dix-sept instrumentistes, deux harpes, un célesta, un orgue et une section de cordes agrandie réunissant au moins vingt premiers violons, vingt seconds violons, seize altos, quatorze violoncelles et douze contrebasses. Voilà pour l’orchestre principal. Quant aux fanfares, elles comprennent chacune, en sus, deux cors, deux trompettes, deux trombones, deux tubas et un jeu de timbales. Brian envisagea donc, au minimum, quelque sept cent cinquante exécutants. L’interprétation proposée aux Proms de 2011 fut la première à atteindre et même à dépasser ce chiffre, dans des conditions presque idéales avec, en tout, plus de 800 chanteurs et instrumentistes. Trois niveaux d’argument musical—dramatique, tonal et motivique—dessinent la logique de l’œuvre. Sur le plan expressif, la Partie 1 est dynamique au sens symphonique du terme, un développement logique issu des réalisations de Wagner, de Bruckner, de Strauss, d’Elgar et du premier Schoenberg. Mais la Partie 2 tourne au drame culturel, qui évoque la totalité de la musique occidentale autour d’un grand texte unificateur. La progression tonale globale est un exemple étonnamment riche et remarquable de ce qu’on appelle parfois la «tonalité progressive», passant d’un ré mineur initial (le ton principal de la Partie 1, qui s’achève en ré majeur) à un nouveau centre de mi majeur. Préfiguré par intermittences dans la Partie 1 et instauré au cours du mouvement 4, il est souvent menacé par d’autres tonalités mais survit dans le murmure choral, sombrement incandescent, des dernières mesures de l’œuvre. Les tons sont, toutefois, souvent interprétés avec une grande liberté, développés par le chromatisme ou l’inflexion modale. Le premier mouvement s’ouvre sur un geste orchestral glaçant, qui nous propulse dans un allegro-sonate modifié avec un premier sujet concis, nerveux, en ré mineur. Sa forme initiale—un saut de tierce puis, à partir de la même note de base, de quinte—est un motif germinal qui va grandir et changer tout au long de l’œuvre. Contrastant à l’extrême, un second sujet lyrique «folklorisant» survient, annoncé par un violon solo en ré bémol avant de virer en ré majeur. Un développement robuste s’empare de fragments des deux thèmes et l’orchestration prend un tour fantastique. La réexposition s’ouvre sur une splendide cadenza violonistique qui rappelle le second sujet, désormais en mi majeur. La première entrée grandiose de l’orgue est une surprise que Brian réserve pour les dernières mesures. Le deuxième mouvement est un cantique processionnel affligé, à 5/4. Deux éléments—un rythme en notes pointées, aux tubas et aux timbales, et une marche-mélodie, majestueuse et flexible, énoncée juste après par les altos et les violoncelles—sont développés, tantôt associés, tantôt concurrents. La musique s’élève jusqu’à des expositions paroxystiques de la marche-thème, le plus grandiose de ces apogées disparaissant soudain dans l’obscurité, avant qu’une clarinette basse mène droit au scherzo-finale Vivace de la Partie 1. Là, un brusque ostinato à la Bruckner, en ré mineur, lance une série d’épisodes contrastés, à différents tempos, instaurant un immense et implacable élan sous-jacent. Le motif principal de l’œuvre revient sous la forme d’un mystérieux et étincelant appel de cor, puis sert de basse pour de violents développements martiaux, gorgés d’images de marches et de fanfares, qui culminent en une fantastique transformation de l’ostinato, bizarrement écrite, avec une curieuse cadenza de xylophone finalement aspirée dans une stridente hétérophonie polytonale. Quatre notes-pédales descendantes, jouées au trombone et amplifiées par tous les cuivres graves, plongent dans un apogée tonitruant, summum logique de l’imagerie de champ de bataille antérieure. Une cadence d’une cinglante détermination ramène la musique en ré mineur; elle s’interrompt soudain pour une coda d’un calme inattendu, terminée par un ultime et chatoyant accord parfait, en ré majeur—celui-là même qui ouvre la Partie 2, l’énorme Te Deum en trois mouvements. L’inspiration de ce Te Deum, Brian la puisa dans les grandes cathédrales gothiques d’Europe septentrionale, dont l’architecture (et la musique qui y était chantée) avait transpercé son imagination le jour où, jeune choriste, il avait découvert la cathédrale de Lichfield. Mais Brian n’était pas croyant, en quelque sens doctrinal que ce soit, et son Te Deum n’est pas religieux mais profane, interprétant le texte en un drame humain et collectif; la conventionnelle expression de louange cède ici la place à une évocation de l’esprit humain en butte à d’immenses forces, où la volonté de se réjouir est sans cesse menacée. C’est ce qui rend si pertinente la citation de Faust sur la page de titre. Ce Te Deum s’essaye à une nouvelle conception structurelle, qui évolue librement tout en recourant à la plus large palette de ressources stylistiques. Il couvre une impressionnante arche allant de la polyphonie vocale néo-médiévale à de violentes explosions de cuivres d’une barbarie purement vingtiémiste. Après en avoir entendu uniquement la première exécution semi-amateur, le défunt Deryck Cooke décrivit ainsi le Te Deum de Brian: «un dithyrambe du complexe contrepoint néo-médiéval, unique dans la musique», qui «laisse apparaître l’esprit d’un génie authentiquement visionnaire» (The Penguin Book of Choral Music, 1962). Brian jette ici toutes ses forces dans les musiques les plus disparates, et le texte se fait puissance unificatrice reliant les différentes musiques au courant de pensée central. Le quatrième mouvement de la symphonie s’attache donc à la louange de Dieu, à l’exposé de ses actes et à sa nature. La radieuse ouverture introduit les chœurs puis les solistes vocaux. Passé une imposante fanfare orchestrale, toutes les forces sont libérées en un fantastique acte musical de réjouissances sans nombre. La musique évolue ensuite via une série d’épisodes contrastifs qui imposent une logique formelle au traitement du texte, tandis que l’atmosphère s’assombrit. Le cinquième mouvement ne met en musique qu’un seul verset: «Iudex crederis esse venturus» («Nous croyons que tu viendras nous juger»). Audacieusement, il s’ouvre sur les quatre chœurs qui chantent en accords parfaits se chevauchant, d’où de denses et étincelants accords-clusters. Le soprano solo chante tout le texte, et les chœurs se lancent dans une polyphonie terriblement complexe et violemment dissonante, scindée en plus de vingt parties. Après une vocalise sans parole pour soprano solo et une fanfare saisissante pour huit trompettes, l’orchestre entre pour la première fois, avec le sinistre poids écrasant d’une marche. Les quatre chœurs, soutenus par des fanfares, proclament chacun le texte, entremêlé de refrains orchestraux. Un vigoureux développement orchestral arrive ensuite, qui va s’intensifiant. Pour terminer, un tonitruant déferlement sonore né de toutes les forces (fanfares incluses) confirme avec éclat le mi majeur final. C’est dans le sixième mouvement, le plus long de tous, qu’on rencontre les plus grands contrastes de matériau, d’expression et d’instrumentation. Un hautbois d’amour solo introduit un solo de ténor vigoureusement expressif («Te ergo, quaesumus …»). L’orchestre entame une sorte de danse céleste, brillamment et gaiement écrite, avec une participation des chœurs, sans paroles. Brian parvient peu à peu au passage le plus complexe de la symphonie, du point de vue de la texture, avec un colossal apogée destiné à toutes les forces. «Salvum fac populum tuum» amène un retour au plain-chant antiphoné, du genre de celui du quatrième mouvement. Après d’autres épisodes, neuf clarinettes d’affilée présentent un allègre chant de marche introduisant un «et laudamus nomen tuum» joyeusement mélodieux, qui aboutit à un summum franchement splendide, des plus tonitruants. Le climat s’assombrit pour une aria de basse angoissée, implorante («Dignare, Domine, die isto»), suivie d’une extatique double fugue pour les seuls chœurs, dont le sujet ramène droit à l’ouverture de la symphonie. Elle cadence tristement en mi mineur puis ça barde: tous les cuivres de l’orchestre et les fanfares, avec six timbaliers et la percussion, lâchent à nos oreilles deux assauts diaboliquement dissonants et provoquent deux déchirants cris choraux («non confundar in aeternum»). La coda, avec sa fervente ligne violoncellistique, est une voix venue des profondeurs, désolée comme jamais en musique. Pourtant, l’ultime murmure choral est en mi majeur, serein et détaché: un mystérieux éclat qui, comme le dit Thomas Mann dans Le Docteur Faustus, «demeure telle une lumière dans la nuit». De par ses forces extraordinairement étendues, The Gothic requiert un lieu particulièrement vaste. Cette œuvre fut créée trente-quatre ans après son achèvement, à Central Hall (Westminster), le 24 juin 1961, avec des interprètes semi-professionnels dirigés par Bryan Fairfax. La première exécution entièrement professionnelle, montée par la BBC, survint cinq ans plus tard, le 30 octobre 1966, quand Sir Adrian Boult dirigea le BBC Symphony Orchestra augmenté, en présence du compositeur nonagénaire, au Royal Albert Hall, unique lieu où cette musique résonna plus d’une fois. Le 25 mai 1980, The Gothic retrouva en effet cette salle pour une nouvelle exécution parrainée par la BBC, avec Ole Schmidt à la tête du London Symphony Orchestra; sa troisième exécution là eut lieu aux BBC Proms, en 2011. In den Jahren 1907/08 hatte Brian ein ausgelassenes Programmstück komponiert, das er A Fantastic Symphony nannte. Fast umgehend vernichtete er die Hälfte der Sätze und behielt nur zwei als eigenständige Werke bei, doch erschien die Gotische aus diesem Grund zuerst als „Sinfonie Nr. 2“. Erst 1966 änderte Brian die Zählung seiner frühen Sinfonien, so dass aus ihr die „Sinfonie Nr. 1“ wurde. In seiner gewaltigen Sinfonie hatte Brian sich in der Tat „strebend bemüht“, ein monumentales Werk mit sinfonischem Aufbau zu schaffen—zu einer Zeit, als ihn private und finanzielle Probleme plagten und seine berufliche Laufbahn eine Flaute durchlebte. Zugleich stellt es eine Hommage an all die Musik dar, die er kannte und die ihm am Herzen lag, sowie an die Menschen, die ihm wichtig waren. „Dieses Werk“, schrieb er am 27. Juni 1926 an seinen Freund Granville Bantock, „ist schon ein Leben lang in meinem Herzen, und natürlich birgt es in sich all jene, die mir lieb und teuer waren und sind—und die mir geholfen und mich geformt haben“. Bei anderer Gelegenheit beschrieb er den fünften Satz (das „Iudex“) als persönliche Erinnerung an Hans Richter, der als Dirigent des Hallé Orchestra den jungen Brian so inspiriert hatte. Die Gotische ist also sowohl ein Zeichen der Dankbarkeit gegenüber der Vergangenheit als auch ein Manifest für die Zukunft: eine kolossale Bekräftigung des Idealismus der „musikalischen Renaissance“ in England, den der Weltkrieg 1914–1918 so grausam erschüttert hatte. Man darf annehmen, dass auch die Momente von Schrecken und Gewalt im Werk unmittelbar auf die Kriegserfahrung zurückgehen. Dem befreundeten Komponisten und Schriftsteller Harold Truscott gegenüber äußerte Brian, das Werk sei ein Geistesblitz von solcher Heftigkeit gewesen, dass er das Ganze am liebsten in rund zwanzig Takten untergebracht hätte. Diese Bemerkung verrät uns etwas Entscheidendes über Brian. Er war kein ausschweifender oder maßloser Komponist, sondern vielmehr sehr präzise. In der Gotischen komponierte er einen Augenblick heftigster Eingebung aus, und zwar so knapp, wie er nur konnte. Das zeigt sich unter anderem daran, dass ihm aufwändige Übergänge zuwider sind—ein Merkmal, das sich durch sein gesamtes Spätwerk zieht: Den Weg von einem Gedanken zum nächsten glättet er nicht, und er komponiert Wesentliches, keine Füllpassagen. Das Orchester ist um viele außergewöhnliche Akteure erweitert: Oboe d’amore, Bassoboe, Bassetthorn, Kontrabassklarinette, Kornette, Basstrompete und Euphonien gehören dazu. Brian führte das auf Henry Wood zurück, der ihm 1907 vorschlug, ein Werk zu schreiben, das die verschiedenen Familien der Blasinstrumente komplett umfasst—also die gesamte Oboenfamilie, alle Klarinetten und so weiter. Brian benutzt sie jedoch nicht dazu, einen undifferenzierten Lautstärkepegel zu erreichen, sondern erzielt mit ihnen eine beispiellose Palette raffinierter Orchesterklangfarben. Neben ihrem „allumfassenden“ Ansatz bei der Instrumentierung ist die Gotische auch eine enzyklopädische Sammlung musikalischer Stile, von Anklängen an die Gregorianik und an die elisabethanische Kirchenmusik bis hin zu Atonaliät und pulsierenden Cluster-Akkorden (im „Iudex“). Brian ließ alles einfließen, was er kannte; und etwas, mit dem er seit frühester Zeit vertraut war, waren erstklassige und virtuose Chöre, die wettbewerbsmäßig sangen und selbst schwierigste Probestücke mit äußerster Präzision vortragen konnten. Die Orchestermusiker werden in der Gotischen vor beträchtliche Herausforderungen gestellt (das Xylophonsolo im dritten Satz etwa ist geradezu eine transzendentale Etüde für das Instrument), doch verglichen mit den Chorstimmen sind diese das reinste Kinderspiel, vor allem mit Blick auf die heftige chromatische Polyphonie, von der das Te Deum geprägt ist. Brian hatte das Glück, mit der Londoner Niederlassung des deutschen Verlags Cranz einen Verleger für seine Sinfonie zu finden, der die Orchesterpartitur 1932 in zwei riesigen (und fehlergespickten) Bänden veröffentlichte. Obwohl die gedruckte Partitur eine Widmung an ein lebenslanges Vorbild von Brian trägt—nämlich Richard Strauss, der die Komposition nach Durchsicht für „großartig“ befand und seine Hoffnung auf eine baldige Uraufführung zum Ausdruck brachte—, zeigt das Werk kaum Spuren von Strauss’ Einfluss (außer vielleicht in einigen Passagen des ersten und des dritten Satzes). Ein entscheidender Vorläufer ist vielmehr Berlioz, vor allem seine Grande messe des morts. Genau genommen stellt die Gotische das extremste Beispiel jener riskanten Zwittergattung dar, die Beethoven mit seiner Neunten Sinfonie schuf. Inwiefern ist Brians Werk eine „Gotische“ Sinfonie? Er benutzt das Wort nicht in der vergleichsweise modernen Bedeutung, die das englische „Gothic“ heute trägt, also im Sinne von „schaurig“—auch wenn sich im Laufe des Werks durchaus düstere und furchteinflößende Dinge ereignen. Er meint damit das Hoch- und Spätmittelalter (ca. 1150–1550), das Zeitalter der Gotik, wie wir es anhand seines prägenden Produkts definieren, der gotischen Architektur, deren höchster Ausdruck die großen gotischen Kathedralen Westeuropas sind. An dieser Epoche entzündete sich die Fantasie der großen romantischen Künstler, und ihr Schaffen ist es, in dessen Nachfolge Brian steht. Geprägt war diese Epoche, wie auch der Stein ihrer Kathedralen, von der höchsten Gewissheit, dass das Leben ein Kampf zwischen Gut und Böse ist. Entstanden über einen Zeitraum von sieben oder acht Jahren (überwiegend nachts, während Brian tagsüber als Notenkopist und Journalist sowie mit unterschiedlichen Gelegenheitsjobs beschäftigt war), verbindet die Gotische zwei lang gehegte Pläne—ein Werk über Goethes Faust und eine Vertonung des Te Deum—zu einer sinfonischem Vision der Gotik als einer Epoche fast grenzenloser Erweiterung des menschlichen Wissens, sei es geistlich oder weltlich, wunderbar oder furchtbar. Die ersten drei Sätze für großes Orchester beziehen sich ganz allgemein auf den ersten Teil von Goethes Faust (Faust als Prototyp des Menschen der Gotik, als wissbegieriger Mystiker auf der Suche nach verborgener Erkenntnis). Doch sie sind lediglich ein Vorspiel. Der vierte, fünfte und sechste Satz umspannen eine gewaltige, einstündige Vertonung des Te Deum, und hierfür verlangt Brian vier Gesangssolisten, zwei große Chöre mit insgesamt etwa 500 Sängern, dazu einen Kinderchor, vier Blechblaskapellen sowie ein Orchester, das selbst die extremsten Anforderungen von Mahler, Strauss oder Schönberg übertrumpft. Genau befolgt erfordert die Partitur mindestens 32 Holzbläser, 24 Blechbläser, zwei Pauker, ein Schlagwerk mit 17 Spielern, zwei Harfen, Celesta, Orgel sowie einen vergrößerten Streicherapparat von mindestens 20 ersten Geigen, 20 zweiten Geigen, 16 Bratschen, 14 Violoncelli und 12 Kontrabässen. Dies ist das Hauptorchester. Die Blechblaskapellen bestehen zusätzlich aus jeweils zwei Hörnern, zwei Trompeten, zwei Posaunen, zwei Tuben und Pauken. Brian sah also ein Minimum von rund 750 Musikern vor. Bei der Proms-Aufführung 2011 wurde diese Zahl zum ersten Mal in fast idealer Form erzielt und übertroffen: Insgesamt waren über 800 Sänger und Instrumentalisten beteiligt. Drei verschiedene Entwicklungsebenen—dramatisch, tonal, motivisch—geben dem Werk seine musikalische Logik. Auf der Ausdrucksebene ist Teil I auf gewohnt sinfonische Weise dynamisch und stellt somit eine konsequente Weiterentwicklung der Errungenschaften von Wagner, Bruckner, Strauss, Elgar sowie des frühen Schönberg dar. Teil II dagegen entwickelt sich zu einem kulturellen Drama, das rund um einen bedeutenden und vertrauten Text die Gesamtheit der abendländischen Musik heraufbeschwört. Die langfristige harmonische Fortschreitung ist ein bemerkenswert üppiges und dramatisches Beispiel für das, was manchmal als „progressive Tonalität“ bezeichnet wird, und führt vom anfänglichen d-Moll (der Grundtonart von Teil I, der in D-Dur schließt) zu einem neuen Schwerpunkt auf E-Dur. Diese schon in Teil I gelegentlich angedeutete und im vierten Satz gefestigte Tonart wird dann vielfach von anderen bedrängt, setzt sich aber bis zum matt leuchtenden Raunen des Chors in den Schlusstakten des Werks durch. Die Behandlung der Tonarten ist dabei oft sehr frei, und sie werden um chromatische oder modale Färbungen erweitert. Der erste Satz wird von einer packenden Orchesterfigur eröffnet, die uns in ein abgewandeltes Sonatenallegro mit einem prägnanten, drahtigen ersten Thema in d-Moll stürzt. Seine Anfangsgestalt—ein Terzsprung, gefolgt von einem Quintsprung mit gleichem Ausgangston—stellt ein Kernmotiv dar, das im gesamten Werk unablässig entwickelt und verändert wird. Einen extremen Kontrast dazu bildet das lyrische, „volkstümliche“ zweite Thema, das zuerst von einer Sologeige in Des-Dur verkündet wird und sich dann nach D-Dur wendet. In der schroffen Durchführung werden Fragmente beider Themen aufgegriffen, während die Instrumentierung einen traumartigen Charakter annimmt. Die Reprise beginnt mit einer herrlichen Geigenkadenz, in der das zweite Thema wiederkehrt, nun in E-Dur. Das grandiose erste Einsetzen der Orgel hebt Brian sich als Überraschung für die Schlusstakte auf. Der zweite Satz ist eine gespenstische Prozession im 5/4-Takt. Hier werden zwei Elemente miteinander und gegeneinander entwickelt: ein punktierter Rhythmus in den Tuben und Pauken sowie eine stattliche, wendige Marschmelodie, die unmittelbar danach von den Bratschen und Celli gespielt wird. Die Musik steigert sich zu Höhepunkten, an denen das Marschthema erklingt; am mächtigsten dieser Gipfel aber versinkt sie plötzlich ins Dunkel, und die Bassklarinette leitet direkt zum Vivace des Scherzo-Finales von Teil I über. Ein rasantes Ostinato nach Art von Bruckner setzt hier eine Reihe kontrastierender Episoden in verschiedenen Tempi in Gang, wodurch unterschwellig ein gewaltiger, unnachgiebiger Vorwärtsdrang entsteht. Das Hauptmotiv des Werks erscheint in Form eines geheimnisvollen, strahlenden Hornsignals und dient dann als Basslinie, während sich ein gewaltsamer und kriegerischer Verarbeitungsabschnitt voller Marsch- und Fanfarenanklänge entspannt. Diese gipfeln in einer traumartigen und seltsam instrumentierten Abwandlung des Ostinatos samt einer bizarren Xylophonkadenz, die schließlich in schriller, polytonaler Heterophonie untergeht. Vier absteigende Pedaltöne der Posaunen, vom gesamten tiefen Blech verstärkt, stürzen in einen donnernden Höhepunkt, der den logischen Abschluss der vorangegangenen Schlachtenklänge darstellt. Eine erschütternd endgültige Kadenz wirft die Musik zurück nach d-Moll, dann weicht sie abrupt einer unerwartet ruhigen Coda, die in einen letzten, schimmernden D-Dur-Dreiklang mündet, mit dem auch Teil II beginnt—das riesige, dreisätzige Te Deum. Als Inspiration dienten Brian bei diesem Te Deum die großen gotischen Kathedralen Westeuropas, von deren Architektur (und Musik) er gebannt war, seit er als Chorknabe zum ersten Mal die Kathedrale von Lichfield gesehen hatte. Brian war jedoch nicht im dogmatischen Sinne gläubig. Sein Te Deum ist nicht religiös, sondern weltlich, es ist eine Interpretation des Textes als menschliches und gemeinschaftliches Drama—keine konventionelle Lobesbekundung, sondern eine Beschwörung des gegen immense Widrigkeiten ankämpfenden menschlichen Geistes, dessen Wille zur Freude sich immer neuen Bedrohungen ausgesetzt sieht. Gerade deshalb ist das Faust-Zitat auf der Titelseite der Sinfonie so treffend. Im Te Deum wird ein neuartiges, sich frei entfaltendes Gestaltungskonzept erprobt, während die Musik sich gleichzeitig so vieler verschiedener Stilelemente bedient wie nur möglich. Sie schlägt einen großen Bogen von neumittelalterlicher Vokalpolyphonie zu schmetternden Ausbrüchen des Blechs von einer Grausamkeit, wie sie erst das 20. Jahrhundert kannte. Nachdem er lediglich die semiprofessionelle Uraufführung des Werks gehört hatte, beschrieb der inzwischen verstorbene Deryck Cooke Brians Vertonung 1962 im Penguin Book of Choral Music als einen „dithyrambischen Lobgesang von komplexer neumittelalterlicher Kontrapunktik, wie ihn die Musik noch nicht gesehen hat“, der „vom Geist eines wahrhaft visionären Genies“ zeuge. Brian bringt für diese unterschiedlichsten Arten von Musik die volle Besetzung zum Einsatz, und der Text selbst wird zur einigenden Kraft, welche die Verbindung zwischen den einzelnen Musikstilen und dem zentralen Gedankenstrang herstellt. So beschäftigt sich der vierte Satz der Sinfonie damit, die Taten und das Wesen Gottes zu preisen und zu beschreiben. Der strahlende Auftakt bringt zunächst den Chor ins Spiel, dann die Gesangssolisten. Nach einer großen Orchesterfanfare wird die volle Besetzung entfesselt, um einen fantastischen und vielköpfigen musikalischen Jubel zu vollführen. Von hier ab durchläuft die Musik eine Reihe von kontrastierenden Abschnitten, die der Textbehandlung eine formale Logik verleihen, während die Stimmung sich verdüstert. Im fünften Satz wird nur ein einziger, furchteinflößender Vers vertont: „Iudex crederis esse venturus“ („Als Richter, so glauben wir, kehrst du einst wieder“). Zu Beginn singen die vier Chöre in kühn verschachtelten Terzen, so dass sich dichte, leuchtende Akkordcluster ergeben. Die Sopransolistin trägt den gesamten Text vor, und die Chöre brechen in einen über zwanzigstimmigen polyphonen Satz aus, der von grandioser Komplexität und scharfer Dissonanz geprägt ist. Nach einer wortlosen Vokalise für Solo-Sopran und einer packenden Fanfare für acht Trompeten setzt zum ersten Mal das Orchester mit einem bedrohlichen Marsch-Ungetüm ein. Die vier von getrennten Blechblaskapellen unterstützten Chöre verkünden den Text jeweils einzeln, unterbrochen von Orchesterrefrains. Es folgt eine lebhafte Orchesterdurchführung, die allmählich an Intensität gewinnt. Schließlich bekräftigt ein tosender Klangausbruch der vollen Besetzung (einschließlich Blechblaskapellen) die Schlusstonart E-Dur. Der sechste Satz ist der längste von allen und umfasst die größten Gegensätze in Material, Ausdruck und Instrumentierung. Die Solo-Oboe d’amore leitet ein üppiges, expressives Tenorsolo ein („Te ergo, quaesumus …“). Prächtig und hell instrumentiert beginnt im Orchester eine Art Himmelsreigen, an dem sich die Chöre wortlos beteiligen. Nach und nach entwickelt Brian die strukturell komplexeste Passage der ganzen Sinfonie samt einem enormen Höhepunkt in voller Besetzung. Mit „Salvum fac populum tuum“ kehren dann antiphonale Gesänge wieder, wie sie schon im vierten Satz erklangen. Nach weiteren Abschnitten präsentiert eine Riege von neun Klarinetten dann ein munteres Marschlied, mit dem eine fröhlich melodische Vertonung von „et laudamus nomen tuum“ eingeführt wird, die sich zu einem markerschütternden Höhepunkt von unverhohlener Pracht steigert. Die Stimmung verdüstert sich, und einer beklommenen, flehenden Bassarie („Dignare, Domine, die isto“) folgt eine andächtige Doppelfuge für Chöre a cappella, deren Thema unmittelbar auf den Anfang der Sinfonie zurückgeht. Eine Kadenz schließt traurig in e-Moll, dann bricht die Hölle los. Das volle Blech von Orchester und Kapellen führt zusammen mit den sechs Paukern und dem Schlagwerk zwei entsetzlich dissonante Angriffe auf das Ohr und erntet zwei gequälte Schreie des Chors auf die Worte „non confundar in aeternum“. Mit ihrer leidenschaftlichen Cellomelodie ist die Coda eine der trostlosesten Stimmen aus der Tiefe, die es in der Musik gibt. Das abschließende Raunen des Chors jedoch erklingt abgeklärt und ungerührt in E-Dur: Sein geheimnisvolles Glänzen „steht als ein Licht in der Nacht“, wie Thomas Mann in seinem Doktor Faustus sagt. Wegen ihres außergewöhnlichen Aufgebots an Musikern erfordert die Gotische eine besonders große Konzerthalle. Die Uraufführung durch semiprofessionelle Musiker unter Leitung von Bryan Fairfax fand 34 Jahre nach Vollendung am 24. Juni 1961 in der Central Hall in Westminster statt. Die erste komplett professionelle Darbietung, organisiert von der BBC, folgte fünf Jahre später, als Sir Adrian Boult am 30. Oktober 1966 in Anwesenheit des 90-jährigen Komponisten das verstärkte BBC Symphony Orchestra in der Royal Albert Hall dirigierte—dem einzigen Ort, an dem das Werk mehr als einmal zu Gehör kam. Am 25. Oktober 1980 erklang die Gotische bei einer zweiten von der BBC geförderten Aufführung erneut in der Royal Albert Hall, diesmal mit dem London Symphony Orchestra unter Ole Schmidt, und ihre dritte Darbietung dort, im Jahr 2011, war zugleich die Erstaufführung bei den BBC Proms. inasmuch as we have placed our hope in you.